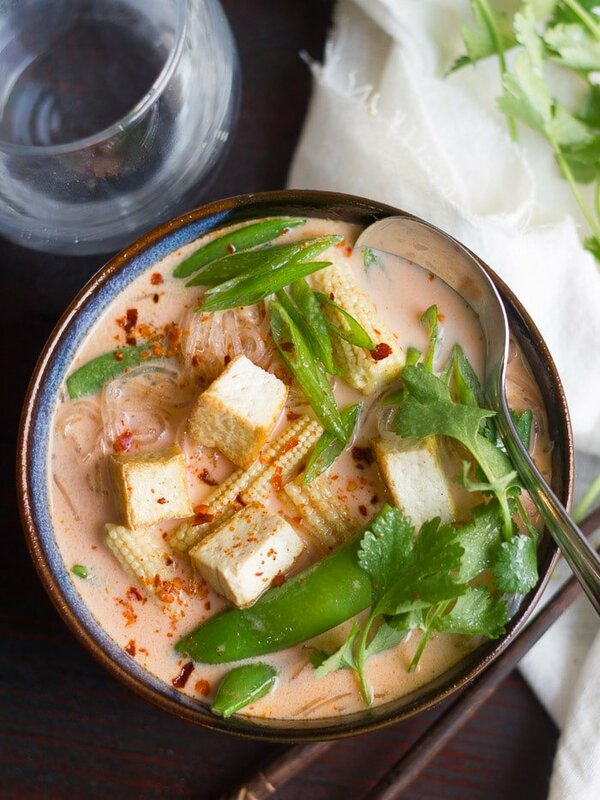 This cozy red curry noodle soup is made with tender noodles, veggies and tofu, swimming in a spicy Thai coconut milk broth. I started the week with a curry recipe, and now here I am ending it with another curry. Don’t be fooled though – the two dishes are completely different. I explained to my husband earlier this week that “curry” is actually a generic term for a dish made with a spice blend. He’s always gone on about how my curries are his favorite dishes that I make. Apparently he’d been assuming the whole time that “curry” was one specific spice which, when featured in a dish, made the dish a curry. This might be news to you. Thai curries, Indian curries, some other curries you’ll find in cuisines of other countries…all different. There’s no specific formula for the spice blend, and sometimes it’s a paste, sometimes it’s a powder. The only common thread seems to be lots of different spices with varied flavors that intermingle to create deliciousness. So, while Monday’s recipe had the flavor of an Indian curry, today’s recipe is more in line with what you’d find in Thai cuisine. The great thing about curries is that since they’re blends of spices, whether in paste or powder form, you can make a big batch at once. After that, any time you want a quick and easy meal, you’ve got your flavors ready, so the meal is delicious, and it usually comes together quickly and easily. 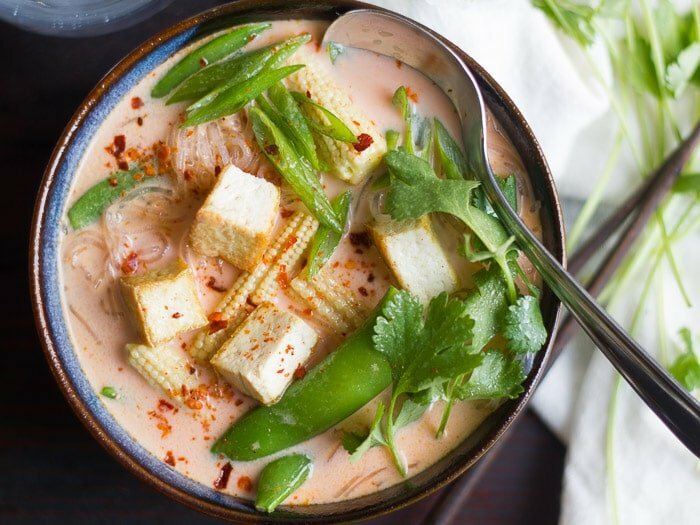 Red curry paste is the only seasoning used in this particular meal, which is kind of amazing because it is packed with flavor. I’ll admit, I sometimes, out of habit, have the compulsion to mince some garlic or grate some ginger when making a Thai curry, but that’s not necessary at all. Every bit of flavor you need is conveniently packed into a little jar of paste. I used my homemade red curry paste for this recipe, which I always keep on hand, safely stocked away in the freezer, for months at a time. You can use store bought if you like – just read the ingredients list, as many contain shrimp paste or similar ingredients. My favorite vegan brand is Maesri. This post originally published on Connoisseurus Veg on November 7, 2014. Updated January 18, 2016. Fill a large saucepan with water and place over high heat. Bring to a boil and remove from heat. Place noodles into water and soak until softened. This normally takes about 3 minutes, but refer to noodle package directions, as brands may vary. Remove from heat and drain. Rinse with cold water. 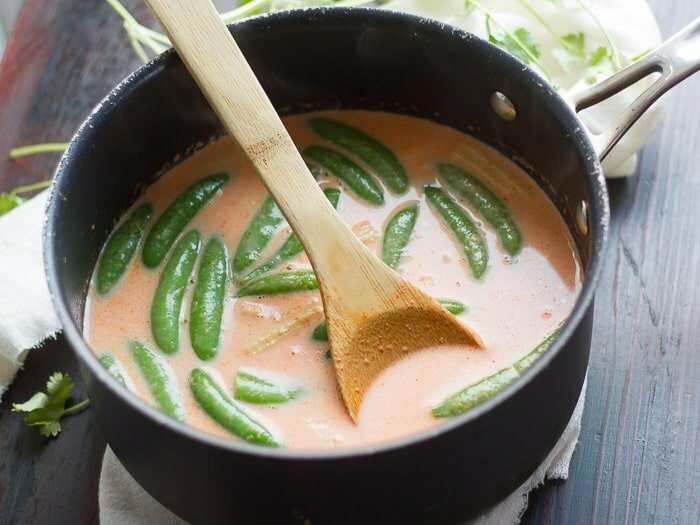 Combine broth, coconut milk and curry paste in large saucepan. If you're not sure how much curry paste to use, start with less and add until you're happy with the flavor and heat level. Place over medium heat and bring to a simmer, stirring occasionally. Make sure to stir enough to blend curry paste into broth completely. Add baby corn and allow to simmer about 10 minutes, until baby corn is tender. Add peas and simmer just until bright green and tender-crisp, 2-3 minutes more. 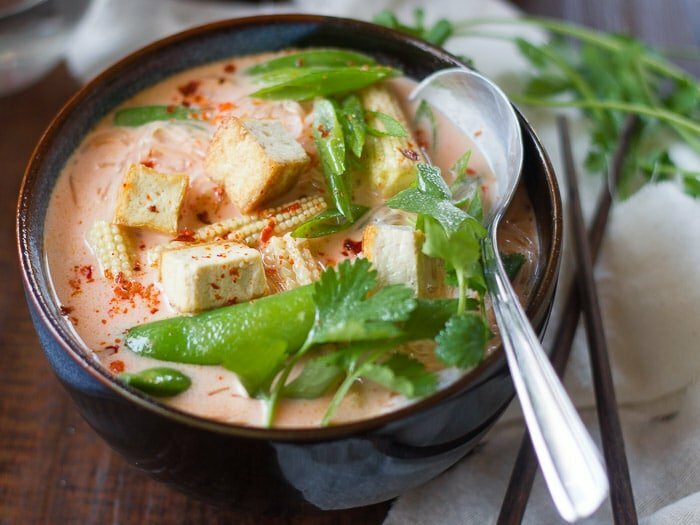 Thin the soup with some additional broth or coconut milk if you'd like it a bit more soupy. Stir in noodles and tofu. Ladle into bowls and top with scallions, cilantro, and red pepper flakes. The original version of this recipe called for 3 cups of broth, and 1 cup of coconut milk. When I remade it to update the photos I decided I'd like it more coconutty, so I updated the recipe as well. I made this last week and it was delicious!!! I ended up subbing angel hair pasta for rice noodles, but it still worked just fine. LOVE! 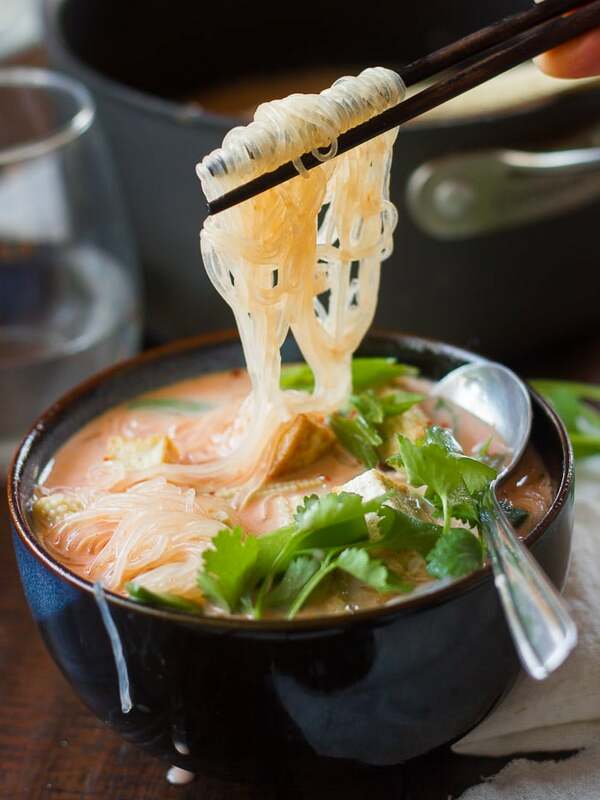 I’ve made this a few times with different types of noodles too! It’s one of those recipes that works with whatever you’ve got on hand. Glad you enjoyed it! Glad you enjoyed it. :) Cashew milk might work. Do you have vegan recipes without onion and garlic as we practice meditation and do not use them and also mushrooms . Thank you and awaiting ur reply . I’m not sure I do, other than baked goods. I know there are a number of blogs that specialize in this, but I’m not terribly familiar with any of them.